The share of Americans for whom Twitter and Facebook serve as a source of news is continuing to rise. This rise comes primarily from more current users encountering news there rather than large increases in the user base overall, according to findings from a new survey. The report also finds that users turn to each of these prominent social networks to fulfill different types of information needs. The new study, conducted by Pew Research Center in association with the John S. and James L. Knight Foundation, finds that clear majorities of Twitter (63%) and Facebook users (63%) now say each platform serves as a source for news about events and issues outside the realm of friends and family. That share has increased substantially from 2013, when about half of users (52% of Twitter users, 47% of Facebook users) said they got news from the social platforms. Although both social networks have the same portion of users getting news on these sites, there are significant differences in their potential news distribution strengths. The proportion of users who say they follow breaking news on Twitter, for example, is nearly twice as high as those who say they do so on Facebook (59% vs. 31%) – lending support, perhaps, to the view that Twitter’s great strength is providing as-it-happens coverage and commentary on live events. These findings come at a time when the two social media platforms are increasing their emphasis on news. Twitter is soon set to unveil its long-rumored news feature, “Project Lightning.” The feature will allow anyone, whether they are a Twitter user or not, to view a feed of tweets, images and videos about live events as they happen, curated by a bevy of new employees with “newsroom experience.” And, in early 2015, Twitter purchased and launched the live video-streaming app Periscope, further highlighting their focus on providing information about live events as they happen. Meanwhile, in May, Facebook launched Instant Articles, a trial project that allows media companies to publish stories directly to the Facebook platform instead of linking to outside sites, and, in late June, Facebook started introducing its “Trending” sidebar to allow users to filter by topic and see only trending news about politics, science and technology, sports or entertainment. As more social networking sites recognize and adapt to their role in the news environment, each will offer unique features for news users, and these features may foster shifts in news use. Those different uses around news features have implications for how Americans learn about the world and their communities, and for how they take part in the democratic process. This examination of Facebook and Twitter sheds light on the similarities and differences of these two prominent social media platforms. Twitter news users are more likely than their counterparts on Facebook to report seeing news about four out of 11 topics: national government and politics (72% vs. 61%), international affairs (63% vs. 51%), business (55% vs. 42%) and sports (70% vs. 55%). Twitter and Facebook news users are roughly comparable for the remaining seven topics covered: people and events in your community, local weather and traffic, entertainment, crime, local government, science and technology, and health and medicine. On Facebook, women are more likely to regularly see posts about health, entertainment and people and events in their community, while posts about weather, entertainment, crime, and health are more commonly seen by women on Twitter – a finding that is in line with our past research. The rise in the share of social media users getting news on Facebook or Twitter cuts across nearly every demographic group. Use of Twitter for news, for example, grew among both users under 35 (55% to 67%) and those ages 35 and older (47% to 59%). And on Facebook, news use grew among both men (44% to 61%) and women (49% to 65%). These data also reveal that news exposure is relatively equal within all demographic groups, with the exception of age. Though news usage among those under 35 increased at roughly the same rate as among those ages 35 and older, on Facebook, younger users are more likely to see news than older users. When it comes specifically to news and information about government and politics, Facebook users are more likely to post and respond to content, while Twitter users are more likely to follow news organizations. About one-third of Facebook users (32%) say they post about government and politics on Facebook, and 28% comment on these types of posts. That compares to a quarter of Twitter users (25%) who tweet about this news topic and 13% who reply to tweets on this topic posted by others. 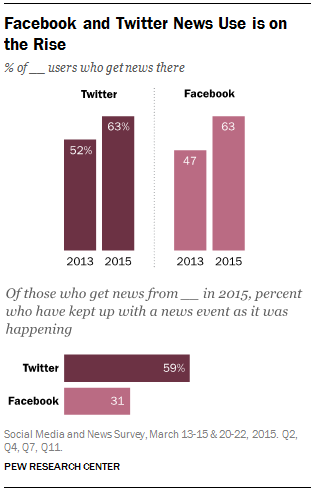 But following news outlets directly is more common on Twitter. About half (46%) of Twitter users follow news organizations, reporters or commentators, compared with about three-in-ten (28%) of Facebook users. This report is part of a series by Pew Research Center aimed at understanding how news and information habits relate to the use of Twitter and Facebook among the American public. The main source of data for this report is a survey fielded over two weekends, March 13-15, 2015 and March 20-22, 2015, among a sample of 2,035 adults 18 years of age or older. Analysis from other Pew Research Center surveys is included where there is relevant data.